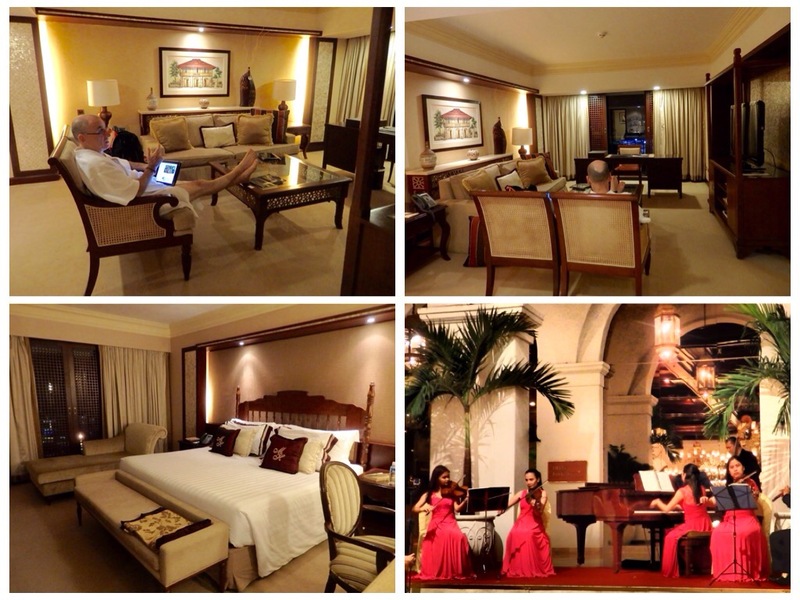 The Manila hotel is old, but nothing about it feels outdated. It has been fully renovated with rainforest showers in the bathrooms, marble floors with beautiful inlaid designs which are polished to perfection, high ceilings, and a truly grand lobby with a live orchestra each night. We chose this hotel because it is located in manicured Rizal park, near the old part of the city. Our room in this glorious Hotel overlooks the Manila Bay, but the room design and feel did not match the charming old world atmosphere that this hotel conveys. We asked to see another room and maybe to upgrade to a suite. We were told that they had already given us the best room on the highest floor, with the best view. In order to upgrade to a suite we would have to contact Expedia, with whom we had made our booking. We still asked to see a suite, to see if it were even worth upgrading to. The suite we were shown was glorious. An elegant large living room with cushy sofas and chairs, a wooden desk by the windows overlooking Manila Bay, two toilets, an amazing dressing room and a rainforest shower. The suite upgrade negotiation did not go well. We asked that the room rate, which we had already paid in full, be deducted from the new suite rate, which was astronomical. They did not operate this way. Apparently each agency claims a different cut which made it difficult for them to retroactively calculate a room rate. Regardless of the indulgent price, we took the suite. I simply did not want to go back to that narrow room after being shown this glorious suite. I am tired of feeling scared to lack money. I place the future in the hands of God and trust that we will be taken care of, as we have always been! Worrying about not having enough money can become a lifelong habit. Needless to say, those who live with financial debts must learn to become responsible with their spending and their cravings. For those who do NOT live in debt, the habit of worrying can make us live with constant guilt, regardless of how much money we might have. This habit can pervade our thoughts and make us illogically fearful even when we are very wealthy. We have all heard about the odd multimillionaires who die with sacks of money hidden under their mattresses, or with huge bank accounts. I know personally people who might not be exactly like that, but are still very irrational in their money fears. I know one couple in Miami Beach who were in their eighties and neither in great health, nor moving towards longevity with healthy living habits, who had over 20 million dollars in cash investments. This couple lived very modestly with no costly living expenses, and even took modest vacations, so the chances of them running through twenty million dollars in their lifetimes were very small, and yet they were absolutely terrified when the stock market corrected. Beside, why is it that we always take note of the days in which the market corrects downwards and we feel fearful, and never feel elated or superbly optimistic when the market surges up and makes us huge profits? I kept reminding all this to myself, as we luxuriated in our suite after an extravagant and most yummy dinner downstairs in the restaurant. The restaurant had an international fresh seafood buffet with food from all over the world, all delicately prepared and very lavish. There were lobsters, crabs in curry sauce, crabs in Thai spices, huge prawns, Spanish dishes, Indian prawns, delicate desserts and everything in between. Over dinner, Jules told me that he observes a contradiction in me between the side of me that wishes to backpack around the world, become a tough yogini who can go for days without food or drink, sleep on hard beds, hike for hours on strenuous mountain paths, and the side of me that truly loves luxuries and comforts. I had no answer… He is right. I began to get first impressions of Manila right after our arrival at the international airport, after a three hour flight from Bangkok. The first of these was that this is a full-on bargaining society, where the opening price a tourist is quoted is rarely the best price available, and not by a small amount either! The official advice was not to use the unofficial taxis; they are known to drive away with the tourist’s luggage or overcharge you. We were advised to take ONLY the official metered taxis. After we had cleared customs and immigration, we were approached by a succession of guys offering us cab rides downtown, at rates which were far above the official, licensed rate of about $7, or 300 Philippine Pesos. The highest offer was on a plasticized rate card confidently shown us by one guy, for more than 1800 Pesos! Another guy promptly approached us and offered us half whatever the previous guy’s rate was, or 900 Pesos – even so, still quite a bit above the licensed rate. But we decided to take him up on his offer, slightly bargained down to 800 Pesos, when he also offered to show us where we could easily get a Sim Card for use in-country. As it turns out, that was a good decision – we heard later at our hotel from a tourist who had arrived at the same time as us, that he had spent THREE hours in line waiting for one of those licensed cabs, and finally, tired and frustrated, quit the line and agreed to pay 1400 Pesos to finally get to the hotel! My second impression was that all of the people we met were really, really friendly, even those who were trying to sell us something. Even if we said no, they often talked with us anyway, sharing good information with us, and smiling, taking a few minutes to chat with us about our trip, or making a helpful suggestion about a place we should be sure to see, or a specialty we should sample. My third impression was that the air quality in Manila seemed much better than many other big cities in Asia, despite the same bumper to bumper traffic you find everywhere. I was surprised to see blue skies and to breathe air that did not seem overloaded with exhaust fumes, especially around our hotel, located next to the port servicing the tankers and container carriers constantly docking and departing from Manila Bay. The busy streets are jam-packed with almost every kind of vehicle imaginable – big, commercial trucks, passenger cars and taxis all share the road with jeepneys, which are diesel-powered, brightly painted stretch jeeps used for cheap transportation all over Manila, three wheeled jitneys powered either by attached bicycles or motorcycles, and the occasional motorcycle and bicycle. There are very few tourists driving rental cars to be seen here in Manila! Our hotel, the Manila Hotel, is a gem dating back to 1912, extensively renovated but still with quite a lot of the charm and elegance it must have had back in its heyday, especially in the lobby, dining rooms and other public spaces. The room we had booked ahead seemed a bit forlorn, almost uncomfortable with its lack of the same grace and scale as the lobby, and we immediately asked to have a look at any upgraded rooms that might be available. Fortunately, a beautiful Sunrise Suite, with floor to ceiling windows looking east, out onto the bay, was available, and it was an easy decision for us to make the change, despite the higher room rate. I feel so grateful, every day, for the abundance that allows us to opt for pleasures such as this! By the time we changed our rooms and got settled, it was too late to venture out for dinner, so we had dinner in the hotel. The nightly buffet featured some of the very best seafood I have ever eaten anywhere, using a global cuisine theme, so that typical dishes from Japan, China, India and the Philippines were all available. What a delight, truly a great start to our trip!